Quake And Tsunami Evacuees Face Radiation Fears In Japan's Northeast : The Two-Way Millions of Japanese lack water and electricity, as relief workers race to save survivors of Friday's powerful earthquake and tsunami. But as they seek food and shelter, a crisis at a nuclear power plant has put thousands on edge. 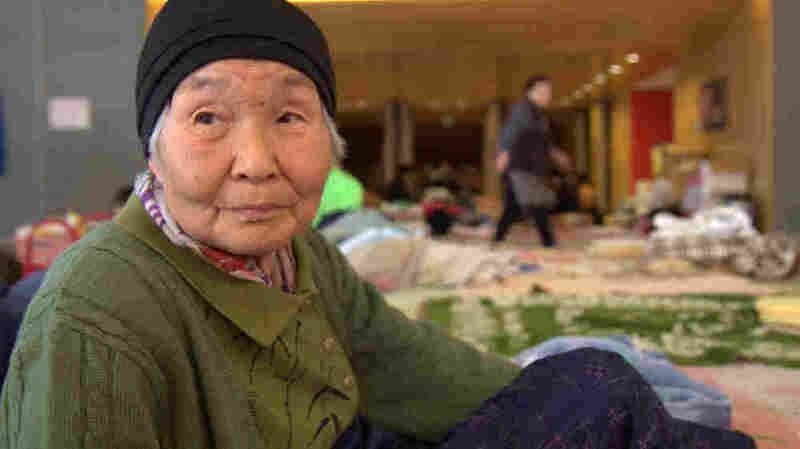 A woman sits in an evacuation center in Fukushima prefecture, where fears of radiation exposure have further complicated the lives of people whose cities were crippled by Friday's earthquake. Millions of Japanese lack water and electricity, as relief workers race to save survivors of Friday's powerful earthquake and tsunami that hit the country's northeast coast. "It's urgent everywhere in the northeast," reports Doualy Xaykaothao from Fukushima prefecture. Government agencies have been sending water, blankets, rice balls and instant noodles to people displaced by the disaster, and it has deployed thousands of workers to help. And even as people struggle to find food and shelter, a crisis at a nuclear power plant in Fukishima put thousands on edge, with fears of possible radiation exposure from the plant's reactors. At evacuation centers in Fukishima, Doualy reports seeing "people sleeping on floors with nothing but the clothes they're wearing. It's urgent everywhere in the northeast. On the streets, you can see lines of people, carrying water bottles, standing at water pumps and fountains." Describing the scene, she says, "Yellow tape surrounds damaged buildings throughout the city. Sidewalks are missing. So are people... One emergency vehicle stops... where tents have been set up. Soldiers stand guard, and men in white suits and masks greet families." The evacuees then form a line, so they can be examined for possible radiation exposure. Doualy says crews were working to repair roads, to help rescue teams reach victims in the north. Reporting from Sendai, a city about 80 miles from the quake's epicenter — much of which was inundated by the tsunami Friday — Rob Giffords tells Weekend Edition Sunday host Liane Hansen that while the city's low-lying areas were completely devastated by the water, several buildings on high ground seem to have suffered little damage from the earthquake. Rob says that down by the water, he saw "cars tossed all over the place, houses tossed all over the place.... the tsunami has wreaked complete havoc up and down a couple hundred miles of coastline here." At Sengen General Hospital, the staff worked feverishly to haul bedridden patients up the stairs one at a time. With the halls now dark, those who can leave have gone to the local community center. "There is still no water or power, and we've got some very sick people in here," said hospital official Ikuro Matsumoto. Osuga said she had been practicing origami, the Japanese art of folding paper into figures, with her three children when the quake stuck. She recalled her husband's shouted warning from outside: "Get out of there now!" She gathered her children, aged 2 to 6, and fled in her car to higher ground with her husband. They spent the night in a hilltop home belonging to her husband's family about 12 miles (20 kilometers) away. "My family, my children. We are lucky to be alive," she said. "I have come to realize what is important in life," Osuga said. Sendai is also the hometown of pitcher Takashi Saito, of the Milwaukee Brewers. "When I hear the names of places" in news about the tsunami, Saito told Reuters, "I start to imagine all the faces of my friends that I know from there. There are no words for this."